We'll beat any comparable quote! We guarantee that you’ll get the best value for your money. Masters Pest Control Sydney offers a full range of pest management options tailored to suit the needs of any business. We conduct pest control for commercial properties, offices, warehouses, restaurants, hotels, clubs, pubs, schools, hospitals and more. Our aim is to solve your pest control problem as quickly as possible whilst minimising disruption to your business operations. Our integrated commercial pest treatment solution will help you remove rats, termites, cockroaches and other pests from your commercial space. Our mission it to protect your business from any unwanted pests. Other - banks, offices, airports. Suffering from a pest infestation? Consult us today! Looking for a local pest control service near you? 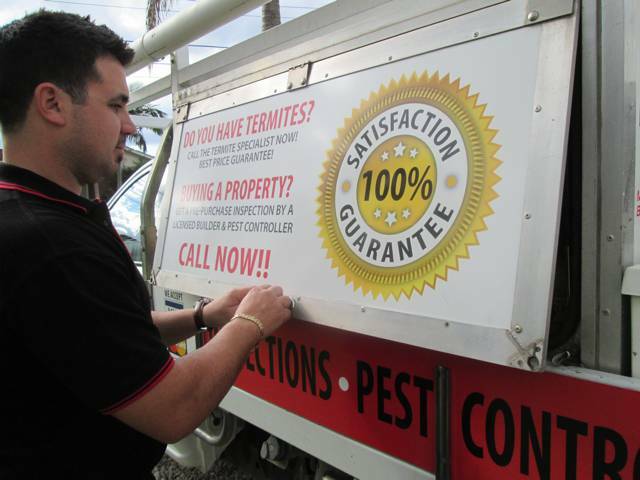 Find out why you can rely on the Masters of Pest Control Sydney! It is important that all commercial pest exterminators have a complete pest removal license and are fully insured for building work. We are proud to be a trusted brand in the industry for having a comprehensive pest control license, inspection license and building license. We have the necessary license issued by the NSW Government. Pest Control Lic: 101967, Builder Lic: 211725C, Inspection Lic: HS0219. We are a member of the Australian Environmental Pest Managers Association. Our commercial checklist ensures we deliver quality, effective and long-term pest control solution. Let's start a regular pest management program for your business. We value long-term relationships with our clients! With over 40 years of combined building and pest control experience, Masters Pest Control Sydney is fully equipped to help you get rid of common pests in your business premises. 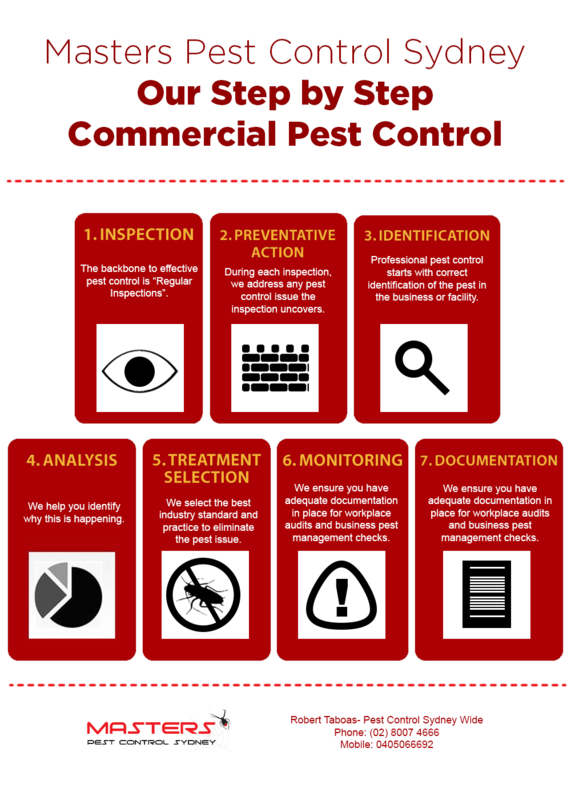 Why is it important to get a commercial pest control on a regular basis? Commercial Pest Management Pest infestation can occur in any location regardless if it is a commercial or industrial business. Pest infestation is one of the major problems encountered in any industry, be it food, hospitality, education, strata and real estate, government, retail, corporate offices, warehousing and more. When there are pests close by, the daily business operations will be affected, causing loss of revenue, drop in the number of customers, and possibly penalties or fines. In order to avoid any unnecessary business losses, you need to invest in commercial pest control. One of the most important reasons why businesses prefer to use commercial pest management services is the need to maintain a completely clean and healthy business environment. In a restaurant, it would be very difficult and unsafe to do any kind of business activities where cockroaches or rats are running around. Similarly, it would be extremely dangerous and harmful if you operate a childcare facility and have pests that can harm children through bites or food contamination. If you happen to spot any rats, cockroaches, flies or any other pests within the premises of your business establishment, it is advisable to act as soon as possible. A few years ago we had one client who operated a successful restaurant in Sydney and Parramatta. As part of the Food Standards Code, the client was required to provide adequate pest eradication documentation. During the course of 3 months, we provided regular pest inspections. A business owner was complacent and decided to leave a pest problem unatttended. The infestation spread, causing over $100,000+ in damages to their food stock. In the age of social media, where a bad customer experience can go viral and spread everywhere, it is advisable to apply preventive measures than wait for your business reputation to be damaged.